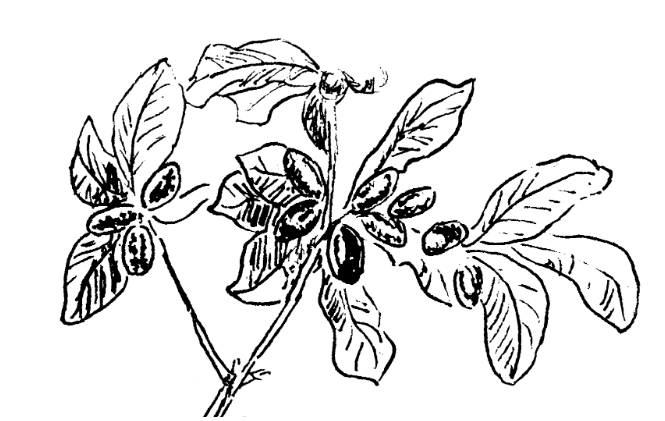 Sketch of the miracle fruit plant, Synsepalum dulcificum.¹ The bright red fruit resemble olives in size. If you haven’t tried miracle berry tablets or powders (as sold here), then it may be hard to imagine their seemingly bizarre effect. Consume this miraculous fruit, and all sour foods, even lemons and limes, will taste as sweet as candy. Even though the effects are only temporary, I was left wondering how this fruit tricks the taste buds. Turns out, the science behind miracle fruit is just as interesting, and nebulous, as its effects. The miracle fruit plant, Synsepalum dulcificum, is a shrub native to Western Africa. Long prior to its documentation by French explorer Chevalier Du Marquis in 1726², local natives used the fruit to sweeten maize bread, palm wine, and other sour ferments. Through this berry, these sour and often unpleasant foods become more tolerable to eat. The berry’s effect is due to a single protein, miraculin, which Kurihara and Beidler first isolated in 1968.³ However, the mechanism of action of miraculin - how it turns sour to sweet - eluded scientists until well into the 20th century. To understand how miraculin works, you’ll first need to know a bit about the basics of taste. Taste recognitions occurs in three general steps. First, the molecules of food interact with taste cells on the tongue, eliciting a cellular response. That response leads to neurotransmission from the tongue to the brain, where the information is finally integrated to generate taste recognition. Taste cells, which are clustered into onion-like structures called taste buds, “taste” food in a variety of ways. The sourness of lemons, for example, is caused by direct influx of protons into taste cells through ion channels, lowering the pH of the cell and triggering a cellular response. That cellular response eventually travels to your brain, leading you to recognize the sour taste and pucker your lips. Sweet tastes are a bit more complex. Specific molecules like sucrose (table sugar)--or even sugar mimics (sucralose aka. Splenda)--interact with sweet taste receptors on the surface of taste cells. After sucrose binds to its receptor, the cell initiates a signaling cascade which leads to a taste response, neurotransmission, and finally the realization that, yes, that candy bar does taste delicious! Taste buds are onion-like clusters of taste cells that lie on the surface of the tongue. Collections of taste buds form papillae, the bumps that give the tongue its characteristic velvety appearance. Left, schematized taste bud structure. Right, isolated cross section of human taste bud4. So how does miraculin trick your taste buds to think sour is sweet? Miraculin interacts with the sweet taste receptor, hT1R2–hT1R3, in a pH dependent manner. Say you eat miracle fruit, then eat non-sour, neutral pH food. Miraculin remains inactive, and the food will taste normal. However, now you eat an acidic lemon, which causes the pH on your tongue to decrease. The low pH causes a structural change of the miraculin molecule, allowing it to interact with the sweet taste receptor, thus triggering a sweet response.⁵ This is why miracle berry, while tasteless itself, has such a dramatic effect on only sour foods. But why can’t you still recognize the sour taste of a lemon, if miraculin only interacts with the sweet taste receptor? The explanation probably lies in the higher-order taste processing centers of the brain, where different taste responses are received and integrated. Now that you know how miracle fruit works, hopefully you’re even more excited to order some and try it for yourself. Let the small, innocuous tablet dissolve on your tongue, and enjoy. Ahhh yes, another “miracle” debunked by science *bites into lemon like an apple*. 1. McVicar Cannon, Donna. “The Old Sweet Lime Trick.” Climacteric Non-Climacteric Fruit, 2006, www.quisqualis.com/mirfrtdmc1a.html. 2. Labat, Jean Baptiste, et al. Journey of the Knight of the Marchais in Guinea, Neighboring Isles, and Cayenne, Done in 1725, 1726 & 1727: Containing a Very Accurate & Very Extensive Description of These Lands, & of the Commerce That Is Made There. Enriched With A Lot Of Cards & Figures In Soft Sizes. Paris: G. Saugrain, 1730. 3. Kurihara, K., and L. M. Beidler. “Taste-Modifying Protein from Miracle Fruit.” Science, vol. 161, no. 3847, 1968, pp. 1241–1243., doi:10.1126/science.161.3847.1241. 4. Smith, David V., and Robert F. Margolskee. “Making Sense of Taste.” Scientific American, vol. 16, no. 3s, 2006, pp. 84–92., doi:10.1038/scientificamerican0906-84sp. 5. Misaka, Takumi. “Molecular Mechanisms of the Action of Miraculin, a Taste-Modifying Protein.” Seminars in Cell & Developmental Biology, vol. 24, no. 3, Mar. 2013, pp. 222–225., doi:10.1016/j.semcdb.2013.02.008.